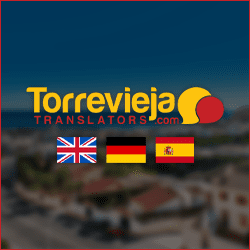 With so much to see and do in and around Torrevieja, it is the ideal choice for a fun filled holiday. There are various bus routes from the city’s main bus terminal that will take you to a number of great beaches and attractions, but for those who have a vehicle there are many other fantastic places to visit within an hour or so drive. High on most visitors to do list is a trip to the vibrant city of Benidorm. 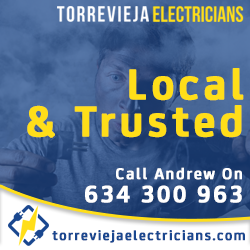 Conveniently located just over an hour’s drive from Torrevieja and less than 40 minutes from the international airport of Alicante, Benidorm attracts visitors from all over Europe and the United Kingdom. The long sandy beaches of Levante and Poniente are regularly awarded the prestigious Blue Flag for their cleanliness and facilities that include lifeguards, first aid stations, sporting facilities, ablutions, sun beds, parasols and disabled access. The beaches are backed by pretty promenades lined with shops, bars and restaurants where the fierce competition keeps prices low. Indeed, many of these establishments entice holidaymakers with free shooters on entry and pints of beer for as little as 1€. Restaurants and takeaways also compete for custom, and popular snacks such as burgers and kebabs can be found for around 2€. For a free meal visitors can try a few traditional tapas bars where these tasty treats are served with your drinks order. Having said that, Benidorm is not just about cheap holidays, and those that have money to burn will find a number of Michelin Star restaurants, gentlemen’s clubs, casinos, yacht clubs and golf resorts. Benidorm is not just about partying till dawn, it is a firm favourite destination for families, and the kids absolutely love it. Throughout the city there are fun things to do such as cinema complexes, video arcades, 10 pin bowling, mini golf, parks & playgrounds, go-karts and boat rides. There are sports centres, swimming pools, beach sports and a whole host of water sports. Families can visit museums, art galleries, historic buildings and beautiful plazas. With all the activities available, you will soon work up an appetite and aside from the hundreds of restaurants in the city, there are all the popular takeaways such as Burger King, Subway, KFC, McDonald’s and a number of pizza parlours and kebab shops. Hardly known until the 1960’s when it was just another sleepy fishing village, the beautiful beaches and surrounding landscape soon brought property developers in their droves and it wasn’t long before high rise holiday apartments, shops, bars and restaurants started being built. Benidorm has come a long way since then and is now one of the most popular holiday destinations in Spain, offering everything from great value package holidays to luxurious 5* resorts. This is truly a city that never sleeps, and night time revelry plays a large part of the Benidorm experience. The city’s hundreds of late night bars and clubs attract huge crowds of young party goers and is one of Europe’s most popular destinations for stag and hen parties. It is great fun to sit outside a bar and check out all the weird and wonderful people go by in their imaginative party costumes. High on the evening agenda for the more mature holidaymakers is a visit to the famous Benidorm Palace, where you can enjoy a superb meal accompanied by a glitzy cabaret show or music concert. Artists and musicians from all over the world come to perform at the palace and it really does make for an unforgettable evening. A trip to Benidorm would not be complete without visiting one of the fantastic theme parks. Terra Mítica Adventure Park is huge and enjoys some of the most thrilling rides in Europe. Its beautiful parkland and gardens are divided into themed areas such as Greece, Rome and Egypt with each area having an assortment of rides, shows, shops and restaurants. There are suitable rides for all the family to enjoy including Flight of the Phoenix where you free fall from a dizzying height. Titánide Roller Coaster reaches great speed with many twists, turns and loop the loops. Prepare to get wet on the Fury of Triton as you plummet down the waterfall, and hang on to your seatbelts when you take on Inferno. The shows on offer are equally as thrilling and watching the performers in their brilliant costumes is absolutely spellbinding. Aqualandia Water Park is one of the city’s most visited attractions and during the peak summer months, a great way to keep cool whilst having a whole lot of fun. This is the largest water park in Spain, and with 20 different rides, definitely a place to spend the entire day. The planning and architecture of the park is stunning and aside from the rides there are beautiful areas to relax with tropical gardens, waterfalls and lakes. The park’s newest ride, Vertigo will send you down a vertical drop at speeds up to 100km per hour !! Family rides include Lazy River and a number of more gentle slides, as well as a supervised children’s play park with water cannons, climbing frames, tunnels and pools. Aqualandia’s centrepiece is a large wave beach with ample sunbeds and parasols. All this fun and exercise can be hungry work and visitors can enjoy a great selection of bars, restaurants and snack kiosks. Benidorm is also home to the excellent Terra Natura and Mundomar zoos which have a fascinating collection of animals and mammals set in natural parkland with shows and rides. 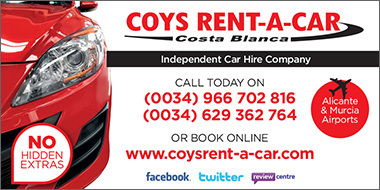 Torrevieja Car Hire © 2019 Costa Insider, S.L. All Rights Reserved. E&OE.